Though not born in Australia, Axel Poignant's work is largely about the 'Outback', its flora and fauna and the traditions of Australian and Indigenous identity. Poignant was born in Yorkshire in 1906 to a Swedish father and English mother, and arrived in Australia in 1926 seeking work and adventure. After tough early years of unemployment and homelessness, he eventually settled in Perth and found work as a portrait photographer, before taking to the road and the bush in search of new subjects. Poignant became fascinated with the photo-essay as a means of adding real humanity to the medium, and much of his work is in this form. 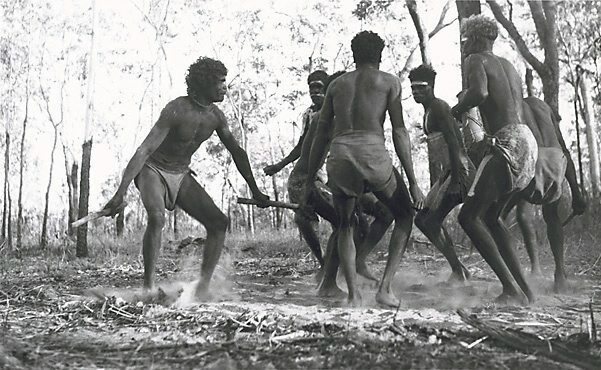 The close relationships he developed with Aboriginal people on his travels are recorded in compassionate portraits of these people and their lives - the low angles and closely cropped frames appear more natural and relaxed than the stark compositions of earlier ethnographic photography. Signed l.r. sheet, pencil "Axel Poignant". Not dated. Rose Peel, Photography: Art Gallery of New South Wales Collection , 'Australian postwar photo-documentary', pg.189-207, Sydney, 2007, 194.